The flexible tool to support you through your transformation journey, and co-produce imaginative, local solutions that work for you… ALWAYS with the person in the centre. 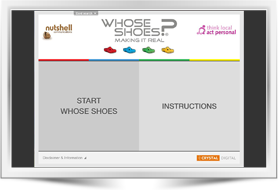 An innovative partnership with the Technology Strategy Board and then Think Local, Act Personal (TLAP) led to the new electronic tool - Whose Shoes?® - Making It Real. 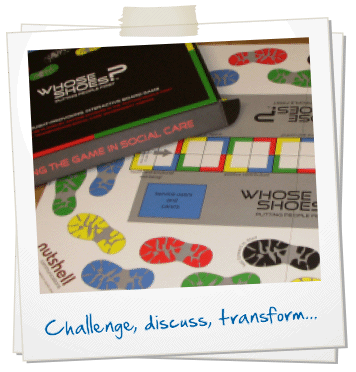 Whose Shoes?® - Making It Real has been co-produced and piloted with a very wide range of groups and organisations. It aligns key messages about personalisation to TLAP's 'Making It Real' framework. It provides a powerful, flexible tool to support you at all stages of your transformation journey, triggering crucial conversations as you work together for excellence in health and social care. Click here to view the flyer. We are very pleased that a version of Whose Shoes?® has been developed specifically around the themes and statements within 'Making it Real'. The tool is a great way of encouraging conversations between people who use services, carers, providers and commissioners. Using this approach can break down barriers between different groups and can cut across hierarchies to create honest and meaningful conversations about what is working well in the system and what needs to improve. And people have some fun too!" It has never been so timely to remind policy makers, commissioners and the front line staff in Health and Social care organisations that each individual is a precious human being. Whose Shoes?® goes a step beyond raising awareness; it engages emotionally as well as intellectually. Gill's work makes a huge difference; I want professionals everywhere to have a chance to walk in my shoes…"
Whose Shoes? 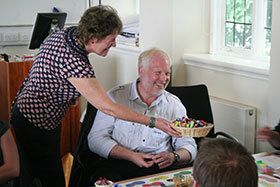 is much more than a 'board game' It offers a bespoke approach, working with you to break down barriers and engage with the people in order to achieve the outcomes you are seeking. It is about hearts and minds. It is important to create the conditions for people to be able to speak freely as equals and to create energy for real action. Please get in touch via the Contact form to learn about the different options for running a #MatExp #WhoseShoes maternity workshop or another topic that is of interest to you. 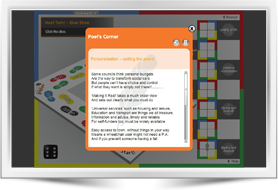 The original board version Whose Shoes?® - Putting People First is still going strong with customers finding it a really hands-on facilitation / co-production tool. The brain-friendly tool is helping a wide range of forward-thinking organisations make progress with the personalisation agenda and wider transformation of public services. People work together as equals, sharing knowledge and experience. They feel that their contribution is valued. A list of the original Whose Shoes? customers is available here ... but needs updating. It is now a very popular tool with the NHS! This section describes the original (personalisation) version, but the main concept is always the same. The messages cover the importance of joined-up services - not only looking at social care and health, but also stimulating constructive discussions about transport, education, leisure; early intervention and prevention; balancing choice and risk, personal budgets and the benefits of involving the wider family and community. 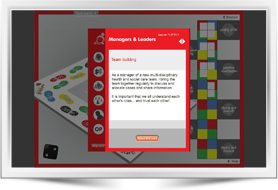 The tool can be used over and over again, each time selecting the cards that are most relevant to your group and planned learning outcomes. Our case studies show you how people like you are using the tool. People walk in each other’s shoes to understand the opportunities and challenges of transformation and what it all means for real people. Key issues are explored, with concerns voiced in a completely non-threatening way. 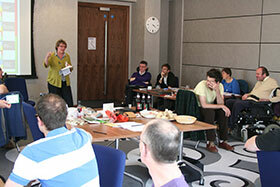 People work together to share good practice and co-produce sustainable, local solutions. Lively Whose Shoes? 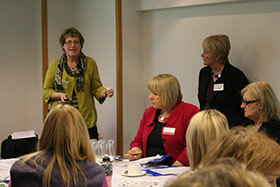 workshops - for individual organisations or at regional and national events...creativity...engagement...innovation.